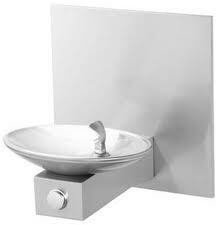 Drinking water fountains are designed to provide drinking water in an instant. Connected to the mains water supply, water fountains have a basin arrangement with a tap or bubbler that dispenses either continuously running water or water on demand. Fountains are typically made from stainless steel and may incorporate carbon filters to remove taste and bad odours from the mains water. They may also include a chilling system to reduce the water temperature. With their basins, waste systems and robust stainless steel bodywork water fountains are ideal for high usage areas such as corridors in schools and sports centres. Although the systems can be perceived as being unattractive when compared to some bottled water coolers or plumbed in machines the systems themselves are very functional, they do not require bottled delivery or even much maintenance and may be left unsupervised as they are robust enough to handle some misuse. For more information about the selection of fountains on offer here at Drinking Water Fountains, contact us on 0845 500 4455 or by email at contact@drinkingwaterfountains.co.uk.